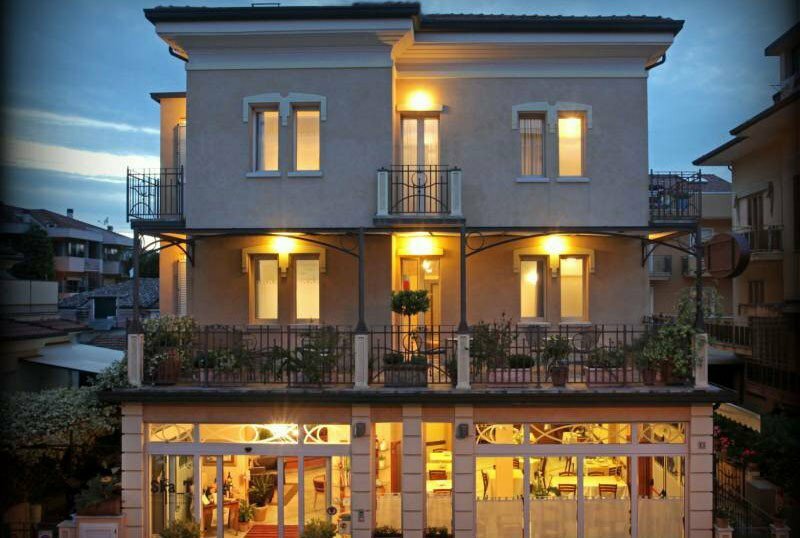 The family-run Hotel Villa Irma , 3 star in Miramare di Rimini, offers comfortable and well-kept accommodation in a quiet area. It has WI-FI throughout the entire hotel, guarded parking fee up to exhaustion, air conditioning and a typical cuisine that devotes much attention to children, celiacs and those suffering from food intolerances. It is accessible to the disabled. Admits small animals. The hotel is located near the center of Miramare, a hamlet of Rimini, a few minutes walk from the sea and only 10 minutes from Rimini Terme. The area is served by the bus line n. 11 that connects Rimini to Riccione. BASIC ROOM: have a balcony, bathroom with curtain, direct dial telephone, satellite TV 22 "LED, hairdryer, safe, free WI-FI, individually regulated air conditioning. COMFORT ROOM: have the same services as the "Basic", to which are added mini-bar and shower. JUNIOR SUITE: accessible to disabled people, it is composed of 4 rooms: relax room with sofa bed, mini bar, shelf table, 22 "LED TV, balcony, independent air conditioning, bedroom with double bed, 26" LED TV, balcony, air conditioning; vestibule room with walk-in closet, mirror, safe and chest of drawers; bathroom with window, shower box with overhead shower, hairdryer, courtesy set, bathrobe, slippers and welcome drink. Free parking is provided for guests staying in this room. Sun terrace with tables and armchairs, open-air porch with seats and tables, free use of bicycles even with child seats, lift, theme nights. PARKING: available subject to availability a few meters from the hotel, paid and guarded. AIR CONDITIONING: available and free throughout the entire hotel. SERVICES FOR DISABLED: entrance with inclined ramp, lift for disabled people, rooms with wheelchair maneuvering space, bathroom with accessible shower and with chair. CONVENTIONS: beach, amusement parks, organized excursions. Upon arrival at the hotel a "quality card" is given for discounted admission to clubs and museums. BREAKFAST: buffet homemade cakes such as cakes and biscuits, savory corner, yogurt, fruit juices, cornflakes, brioche, fruit, organic jams and local honey "farm-to-table". LUNCH AND DINNER: the cuisine is typically Romagna, with a fondness for products "farm-to-table", tasting of typical IGP and DOP products and a wine list taken care of by the owner. Every day we serve 2 menus of your choice, accompanied by vegetables and side dishes in buffet style. Desserts are homemade by the chef, fresh pasta is handmade. VARIATIONS: the hotel is a member of AIC and prepares menus for celiacs with the same traditional dishes but cooked from gluten-free flours. In the hotel: outdoor playground area, bicycles with child seats. On request: bottle warmers and strollers. In the room: deckchairs, bath tubs, WC reducers and radios. Cots and bottle warmer on request. At the restaurant: child seats, children's menu, baby food with organic vegetables and meals at early times. Baby chef snack once a week. On the beach: live entertainment, baby park, nursey, sports fields. At the beah affiliated with the hotel n. 144 is equipped with playgrounds, entertainment for adults and children, baby club, sea games, nursery, WI-FI connection, pedal boat rental and canoes. Gluten-free breakfast for those who are intolerant! Only for you an unmissable offer! Rimini in this period is fantastic for getting to know and visit the castles of the hinterland or museums with our Quality Card! Choose the period from 20/04 to 28/04 in half board and the type of room that best suits you, Basic, Comfort or Junior Suite!